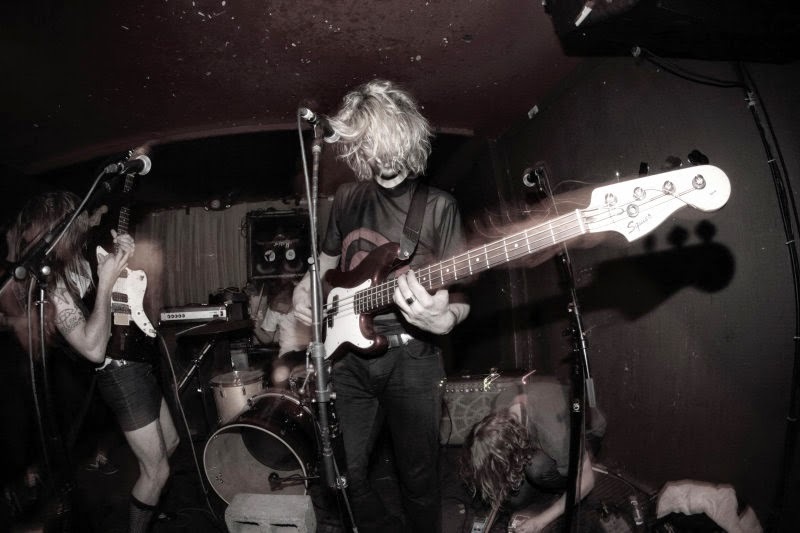 Always with the intent of driving a drill bit in to the temporal lobe, this go 'round for San Francisco's deviling's of dumpster diving psychedelia they take one for making one inch dowel holes and aim it right at the third eye. Taking up the entire A-side of of this 12inch EP is the 11+ minute "Cokesmoker." The song rolls in like bad weather. Squalls of biker rock wah-wah guitar glissade over a coarse rhythmic throb while voices, sometimes resembling a bad drug Nick Gilder and at others a smashed mumble, intone ominous thoughts. Feedback piles up building a thick wall of psychedelic caterwaul that is not a a bunch of swirly colors but a bright, blinding white light that guides the spaceship which starts starts honing in for a place to land toward the tail end of the song. On the flip, "Out Of Design" pumps like the beat of the heart mic'd and run through a bit of gain. Sounds resembling snippets of bluesy guitar twang and ghostly voices promenade to the tension. "Dark Afternoon" gurgles and blurts like things left on the Silver Apples cutting room floor being reassembled randomly.The weird trip ends where it started with a reprise of side one's maelstrom. No need to warn anyone about not operating this under heavy equipment as it IS the heavy equipment.